Minnewaska State Park is truly a remarkable resource for all New Yorkers, but rock and ice climbers have a special interest in this section of the Gunks. Indeed, there are miles of expansive cliffs made of impeccible quartz conglomerate, the same stuff that makes up the world-famous Trapps cliff a few miles away. A viewer in New Paltz sees a line of rock forming the divide between steep forests and the sky. A ridge draped in cliffs stretches out of sight. In Minnewaska, climbing those cliffs is illegal. 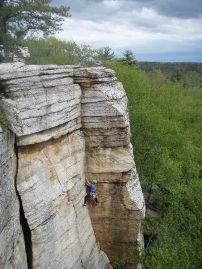 Climbers first began visiting the cliffs of the Gunks in 1935, when Hans Kraus first climbed the imposing face of Millbrook Mountain (the summit of which is within Minnewaska State Park today). Though most climbing then centered around the more popular Trapps, Near Trapps and Skytop cliffs, undoubtedly there were explorations to the lesser-known cliffs of the ridge where new routes were established. As decades went on these outlying crags received even more attention, and progressively more difficult routes were accomplished. 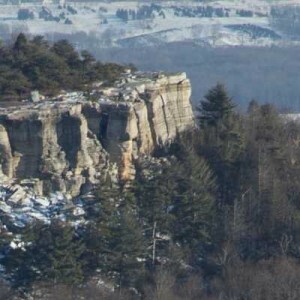 For almost a century prior, many of these cliffs were located on land owned by the Minnewaska Mountain House (or Cliff House) and Wildmere hotels. These businesses became defunct in the 1970s; the land was purchased by New York State in 1987 and opened as Minnewaska State Park Preserve in 1993. Upon its purchase, the state concluded that climbing did not fit within their concept of park management, and could not be condoned. Overnight, climbing became an illegal activity on much of the Ridge. After several periods of expansion, the park now consists of over 21,000 acres of protected land, and hosts the only two cliffs in the New York State Park system on which climbing is sanctioned. The Peterskill area was opened to climbing in 1996; the adjacent Dickie Barre area was opened in 2013 (more on that later). Both are highly managed, with well-defined trails, educational signs and closures of ecologically sensitive spots. Climbers access the cliffs from the park office, where they must sign a waiver and pay a climbing day-use fee of $10. A park ranger typically patrols the cliffs on weekends. The ban on climbing in the rest of the park, and New York State Parks in general, is unprecedented and unfounded. It is among the largest closures to climbing on public lands in the entire nation. All other states bordering New York (that’s Pennsylvania, New Jersey, Connecticut, Massachusetts and Vermont) allow access to climbing on public land. The Peterskill and Dickie Barre represent less than 1% of the climbable rock in New York state parks. 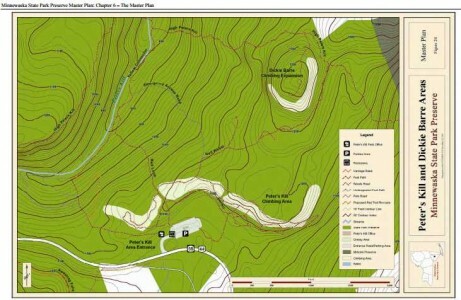 Though development of a climbing management plan was a Priority 1 issue in Minnewaska’s 2010 Master Plan, the park has since moved onto Priority 2 topics without any open dialogue with the climbing community. Despite its reluctance to allow climbing on public lands, Minnewaska State Park should be reminded of the benefits of managed recreation. More allies for the state park system could be born in the rugged backcountry of the Gunks. Greater access to the outdoors bolsters local economies, and has been shown to have a positive effect on the emotional and physical health of surrounding communities. 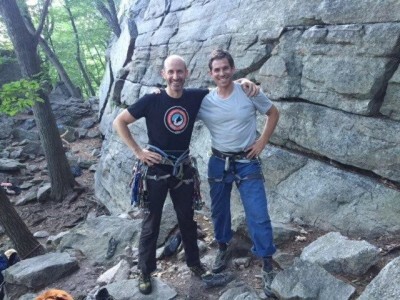 Rock climbing is part of the Hudson Valley’s cultural history, and the internationally-famous Gunks are visited by climbers from around the world every year. There was a brief spark of excitement in 2013 when the Dickie Barre area was opened adjacent to the Peterskill. A relatively small cliff, the Dickie Barre still boasts some routes near 100′ tall along with a unique, exposed position on the ridge. It is just a peek at the amazing climbing opportunities that exist at dozens of different crags on the Ridge. 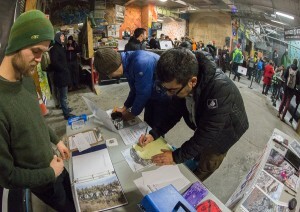 Momentum is building in the efforts to finally open climbing in New York state parks! The coming months will be most important in showing the state that climbers are a responsible, educated and ecologically-sensitive user group that deserve access. Click here for information you need to send your own letter to Minnewaska State Park Preserve. We are pleased to report that a cooperative effort of the GCC and the Access Fund has made significant progress toward the goal of expanded climbing opportunities within Minnewaska State Park Preserve. Thanks to your letter writing efforts, the New York State Parks Commission is now open to discussing an expansion of climbing access in Minnewaska. Help us expand climbing opportunities in Minnewaska State Park Preserve by using the Access Fund's Action Alert letter-writing tool to tell New York State to develop the climbing management plan they said they would. Hans Kraus, Gunks climbing pioneer & one of the fathers of sports medicine & rehab, wrote one of the first letters to expand climbing opportunities in Minnewaska. 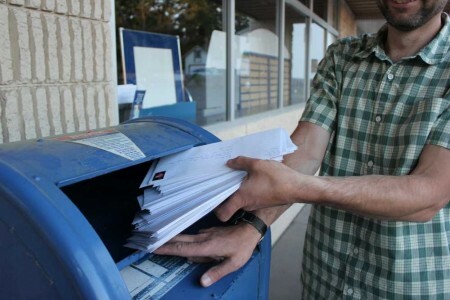 The GCC has embarked on a major letter writing campaign to encourage NY State to provide more opportunities for climbing in Minnewaska State Park Preserve. If you value climbing as a cultural and historical part of our community & want access to new cliffs, then please volunteer to help the GCC open up access to miles of cliffs in Minnewaska State Park Preserve. Highlights from the draft of the Minnewaska Master Plan and Environmental Impact Statement, which was released on 9/30/2009.